I apologize for the long gap between posts; most of my work has been proprietary recently, so there's not too much to share on the blog. Therefore, I'm presenting a personal project: a retrofit of a late-1960s era cabinet record player. It's a Fleetwood model 4057, made in Montreal, serial 283. It came complete with AM and shortwave radio, record player and tape input, powered by a tube amp rated for 117 V, 0.95 A at the input. I believe these units were retailed by Sears. 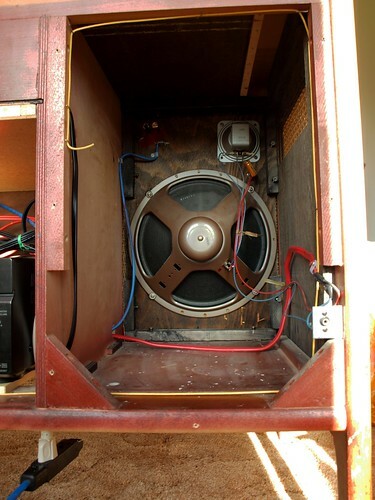 The guts were all removed and replaced by a modern turntable, digital music player, amplifier and controller. 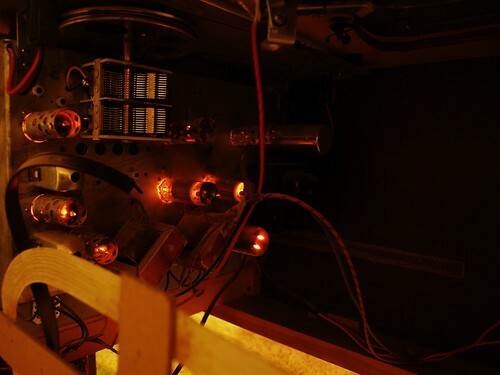 Before the retrofit, the unit lights and tubes lit up. On radio, it crackled when you adjusted the volume but couldn't be tuned to any station. 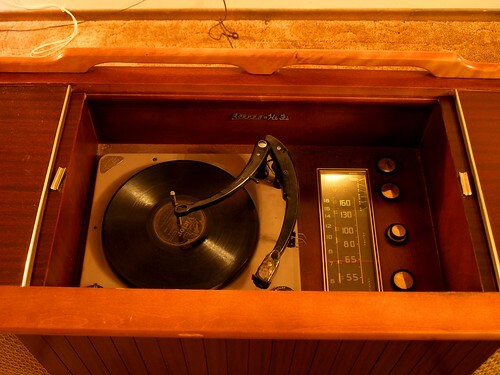 The record player wouldn't rotate and no sound was produced when the record was turned by hand. So the radio/amp was removed and sent to the tube amp hospital and the record player went to the morgue. The first step in the retrofit was to replace the record player shelf as it had a large cutout for the sunken turntable. I took this opportunity to add some vibration isolation. I expected structural feedback to be a significant problem because the speakers and turntable are mounted in the same unit, as opposed to satellite speakers. 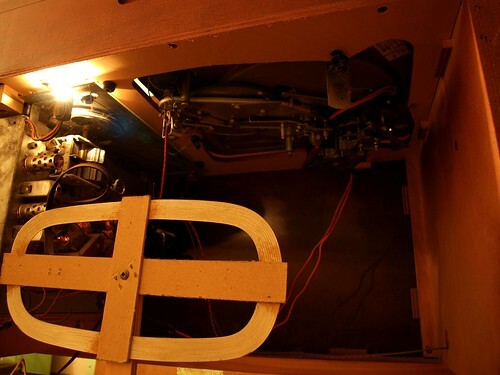 Thus, the turntable shelf was designed to be a massive vibration isolator. 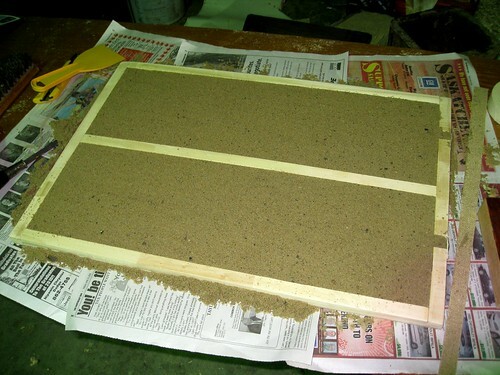 The shelf is constructed of a wood frame with hardboard top and bottom panels, filled with sand. 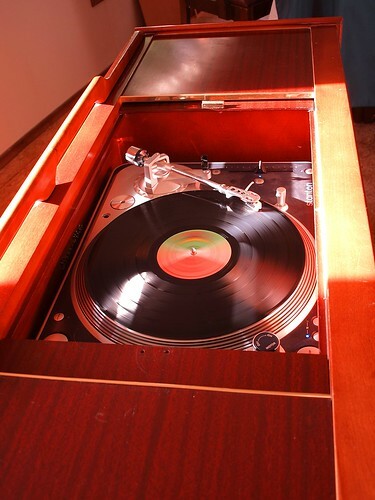 The turntable was replaced with a Stanton T.80 turntable, capable of digital S/PDIF output. Next: digital music. Digital music is played by a VIA Epia M10000 mainboard. This is a small form-factor (Mini-ITX) low-power computer. It's a bit underpowered for video, but is perfect for a mp3 and internet radio player. I've installed Ubuntu server and use VLC as a media player, controlled either over SSH or with its web interface. The amplifier is an older Sony, purchased second hand for cheap. It sits in the centre cabinet. The computer provides one analog input and the turntable provides a digital input. The integrated speakers mean that the speaker cables need not be flexible after installation, so I used solid 12-gauge residential electrical cable ($1/foot at Rona for essentially no resistance and no chance of phase distortion from complex impedance). The original speakers (12-inch woofer and tweeter) haven't been replaced yet (and may not be). 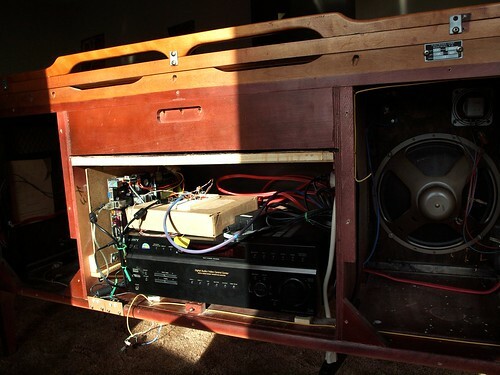 Since the amp is mounted in the belly of the cabinet, the remote no longer works. I worked around this by using a microcontroller to relay the IR remote signals. There is an IR sensor behind the cloth of the right speaker, which is processed by an ATMEGA168 microcontroller. 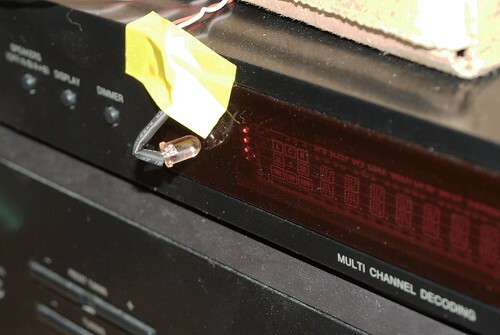 Signals destined for the amplifier (Master Volume, etc) are repeated on an IR LED temporarily taped to the amplifer's remote input. Signals that target the digital music player (track forward, etc) will be passed to the computer over USB (this functionality is not done yet). The USB link will also allow one to control the amplifier over the network. A preamp and mixer will use digital pots driven by the microcontroller to adjust the relative levels and tone of the turntable, digital music player and an aux input. This function is not yet operational, but I can dim three leds using the remote. All of this is being prototyped on an Arduino board since it has USB connectivity and there is a nice library of IR remote functions (written by Ken Shirriff). So how does it sound? I haven't done any acoustic analysis yet and I hate audiophile-style subjective reviews, but, to my ears, it sounds really good, especially considering the vintage speakers. There is no discernible distortion at normal listening levels (as long as I remember to set the soundcard gains to avoid digital clipping). Unfortunately, my massive sound isolator is not super effective. At high gains there is a 94.1 Hz feedback that can be eliminated if I put all my weight on the cabinet. This frequency corresponds to a 10.6 ms delay (assuming there is no signal phase changes) which at a sonic speed through wood of 3300 m/s would require a signal path of 35 m, clearly much longer than the size of the console. This leads me to believe there is a significant delay in the turntable's analog to digital conversion process. 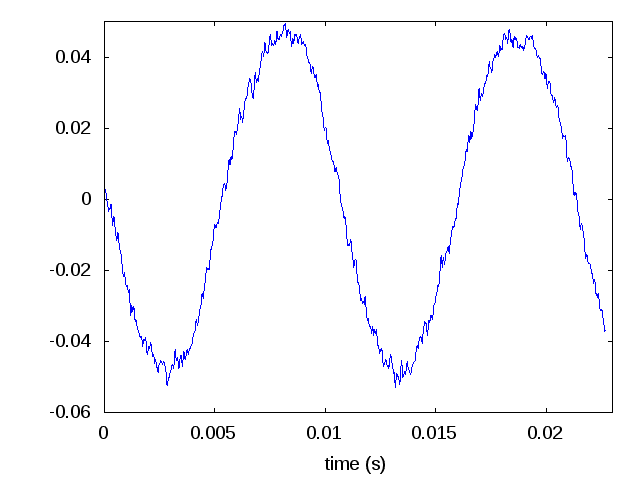 Perhaps switching to the analog output (with presumably no delay) will solve this problem, although it may just move it to a higher frequency. Alternately, the solution may be to reduce the coupling between the cabinet and the turntable shelf. The shelf is a relatively tight fit so the effective spring between the console and the shelf is relatively stiff. I plan to modify the shelf mounting so that it has no solid contact with the cabinet, being suspended on acoustic foam or a semi-liquid like acoustic caulk or Blutack. Next: performance characterization and speaker optimization. Edit 20/09/2009: I almost forgot to mention that I plan to host a session on microcontrollers at Bar Camp Saskatoon. Although I would want some nice JBL, EV or Eminence Drivers, if I could afford them... heck the last time I heard a new Peavey setup, they sounded darn good too. Have you looked into Neoprene padding? I've had good results using neoprene pads or mats that cover approximately 15-30 % of the contact area (usually four 1" squares on a piece not much larger than two square feet total) for vibration isolation at 60 Hz and above. Although I hate to suggest rebuilding the record player shelf, using the Masonite with thin strips of neoprene, maybe 1/8" thick where you currently have the bits of 1 by (unless my eyes fail me, and you have some other dimension serving as you rails and stiles on that shelf between the sand) but keeping the sand for any lower frequencies you're concerned about? It's a beautiful project regardless, and the remote fix is significantly more elegant that what I would have come up with. Kudos, sir. 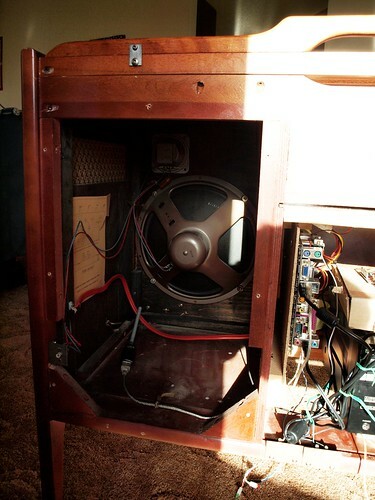 I had considered using a suspended speaker box inside the cabinet speaker box. However, if you look at the speaker interior pics, you can probably see that the drivers' flanges are right up against the cabinet walls. Meaning I'd have to replace the drivers with smaller ones. Good idea about the neoprene mats. I assume you mean to put them between the shelf and the turntable's feet. Unfortunately, there is about 1 mm of space between the top of the turntable and the sliding top doors, so I can't lift it any more. I think your idea about using a neoprene spacer instead of the wood might work but would require a bit more extensive rebuild and analysis. The top plate of the shelf is the one that fits into the groove of the cabinet (again due to the limited headroom) with the massive shelf hanging from it. So if you put a springy layer between the top shelf and the the bottom, you'd be effectively separating the turntable from the mass by a spring (rather than the intended hard coupling between the mass and turntable with a damped spring between the mass and the cabinet). That might work, but would behave as a hard-to-tune tuned mass damper. Instead, I'm considering cutting the rails off and supporting the entire shelf on blocks from below, with a springy/damping material between the shelf and cabinet. Very cool project! Love it. About those original speakers, I know many of these older consoles had German made alnico drivers (Grundig, Saba, Isophon, etc.) that are very highly regarded. I'm curious what model yours has. I've got no idea what kind of speakers they are. No manufacturer marks, just cryptic numbers. 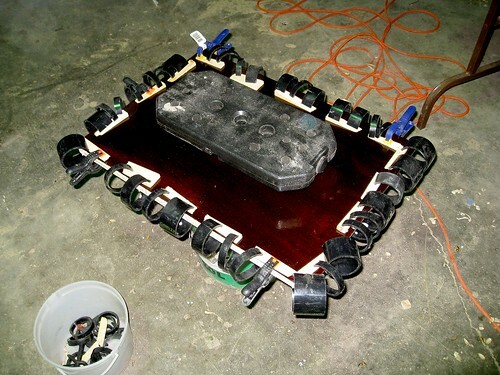 Also, good to see some Kiwi ingenuity on the web! MPD is up and running. Having a bit of trouble getting Ampache going, but I've got a client that runs well over SSH. Good job. I'll bet it sounds nice and soft with the original wood cabinetry and speakers. I played with Ampache for awhile too, but found that it wasn't exactly the tool I needed, since it maintains its own music catalog and just streams info to MPD, which means its playlists are not sync'd with MPD's (and thus, not with the various native clients). I ended up using IPodMP (http://mpd.wikia.com/wiki/Client:IPodMp) for the web client, but most of the time we just use native clients. @Sean: Ooh, Client175 looks nice, I'll have to give it a go. 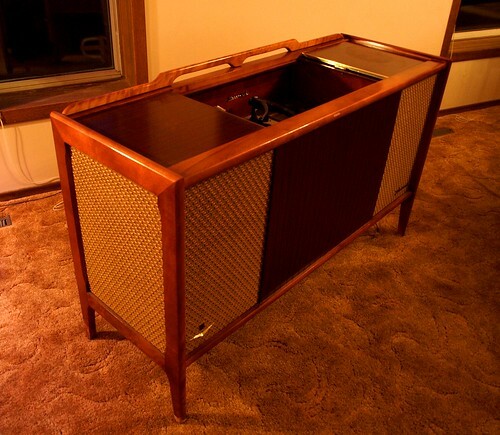 I want to retrofit an old Philco console with a turntable, cd player, radio and iPod jack. Could you be an advisor? I've noticed my problem. thanks.